It’s hard not to like it: Bill Cunningham is a modest and charming man and he’s irresistibly likable. The film as a whole was irresistibly likable to me as well because it’s set in New York and Paris, it features the New York Times, it’s a documentary and a history, and it’s all about clothes and fashion. It’s also very thoughtful and smart. Really, what’s not to like? There are many great threads going on in the film. First off, it is a character study of Bill. What makes him tirelessly trek up and down Manhattan on his bicycle, taking all of the photos that he does? What does he live the modest life he lives? How is it he is so close to these people he seems nothing like in many ways? Bill is both an aesthetic and an ascetic, which I found fascinating. He is driven to find beauty in the world and capture it, while at the same time living a monk-like existence in his tiny apartment above Carnegie Hall. He loves great clothing, yet he wears the most minimal of things for himself. He is well known by the rich and powerful, yet he lives a frugal life, living with no kitchen and sharing a common bathroom. In fact, there are a great many contrasts in the film. Many of the people interviewed live in wealthy homes or are extremely fashionable and stylish. Bill is none of those things. He is admired and lauded, but all he wants to do is be invisible and take photographs. At one point he takes about how great designers were inspired by bag ladies, and how in some ways this was a taboo topic. The film is packed with history. It’s mostly recent, but I sense the filmmakers are especially attuned to life in New York in the 80s. Much of the music in the film is from that time period, and there is alot of talk of when Bill worked for Details magazine at the time. But it is really not of one time and Bill is timeless (and seemingly ageless) in many ways. Bill Cunningham reminds me alot of the great Parisian photographer Eugène Atget. Like Atget, Bill is an artist, but like Atget, his artistry comes through not in his rejection of things but in his acceptance of things. Like Atget, Bill wants it all. He wants all his pictures in the paper, he wants all types of people to be perceived as stylish and fashionable and beautiful. That’s not to say his photos are random or accidental. He takes photos quite deliberately. I think he is in love with the world and the beauty of the world, and he cannot see why he should reject any of it. There’s much more about the film and the man that is interesting, but I’ll leave that for you to discover when you go and see it. Even if you did not like clothes, I think you’d be fascinated by this man and what he does. I greatly admire him, and I am glad they made a film about him. I think you should see it. Right now it is playing at the Varsity in downtown Toronto. * My estimate of how many photos Bill has taken since the 1960s, based on at least a 24 roll a day, 365 days a year. I am getting social media fatigue. This is too bad, because I am a fan of social media and social computing and I think it is the future. And I will come back to it more when social sites learn to deal with one of the biggest problems I see now: microspammers. Microspammers to me are people who generate alot of updates every day. They end up dominating the signal, like people at a party who try to dominate the conversation. I go to my feed reader and check out blogs like AndrewSullivan.com or Mashable or The Daily What. I like them all, but each day they create dozens and dozens of posts. It’s actually stressful to deal with. Over on blip.fm, same thing. A few DJs blip dozens of songs each day, making it hard to pick out music. Facebook? Yup. Newsfeed is more or less reflective of twitter. Now Linked.In is doing the same thing. This doesn’t count the daily email spam from digital magazines, etc. I have tried to manage it. I dropped alot of tweeps, feeds, DJs, "friends" and now colleagues. I’ve tweaked my profile and settings on all these platforms. But that only goes so far. What happens if your colleagues or family and friends are the microspammers? Do you drop them and risk offending them? Or do you do what I am doing, and considering dropping out instead. Indeed, for alot of these sites, I used to see alot more usage of them than I do now. Social media sites need to develop better filters. And develop them soon. I think they won’t though. They’re greedy for traffic, and filters naturally cut down on traffic. Network externalities will prevent rapid decreases in usage, just like new features might. But I suspect that alot of them will be surprised that they have collapsed because inside they were hollowed out. Or they became bloated and slow and were surprised to be passed by a lean and nimble competitor. Also, people using social media need to develop a better sensitivity to what they are doing. I am sure I can faulted with this too, but I am trying to be considerate of all the things people are reading. And frankly, if you think it is too much, I’d perfectly understand if you stopped following me in one area or another. I will still use social media, but in a different way than before. It’s time to put it in perspective. I lived in the St. Clair area of Toronto in the 1990s when there were two movie theatres and three big book stores. Sadly, they all closed down in the next decade (although a Book City opened in that area recently). I always felt it was an undervalued neighborhood, overshadowed by the more bustling Yonge and Eglinton area just north of it. Along St. Clair are a number of corporate offices, including one of my favorites: the Imperial Oil building. Located at 111 St. Clair Avenue West, it is going to be converted into a condo, the Imperial Plaza. It’s a beautiful 20th century modernist structure with an interesting history. The Imperial Oil Building, designed by Alvan Mathers, is a skyscraper outside the downtown financial core of Toronto, Ontario, Canada. Located at 111 St. Clair Avenue West, the 21-storey building was built in 1957 as the headquarters of Imperial Oil, Canada’s largest oil company. The architectural model for this building was the original design for the Toronto City Hall. Nathan Phillips, Toronto’s mayor in 1955, rejected the Mathers and Haldenby design for city hall and opened the commission to an international competition that was eventually won by Finnish architect Viljo Revell. Imperial Oil, in search of a design for their Toronto head office, bought the design from Mathers and Haldenby. During construction, catering to the wealthy local residents, welding rather than the then-customary and much noisier riveting technique, was used. The building, on completion, was the largest all-welded steel frame building in the world. When Imperial Oil assembled the residential properties for the site, Isabel Massie, owner of a house on Foxbar Road, at the rear of the site, refused to sell, despite being offered what was, at the time, a princely sum for her house. Until she died, her property jutted into the Imperial Oil parking lot, an icon of a citizen’s refusal to give in to a corporation. Her estate sold the house to Imperial Oil, which demolished it. The interior layout is based on the ‘core’ concept, with most offices having windows and with the various service elements (elevators and meeting rooms) clustered in the centre. 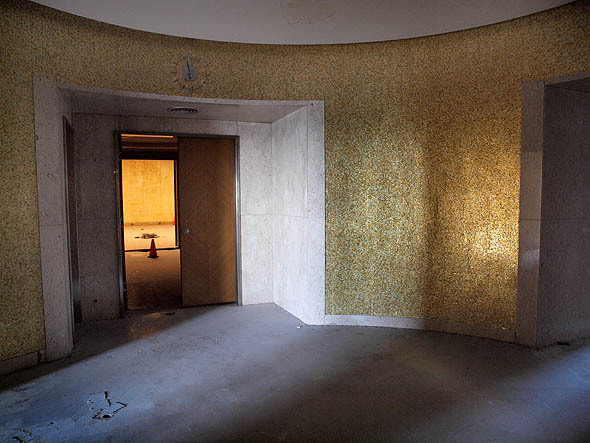 With its thick walls, relatively small windows, a built-in cafeteria, a location separated from major targets, and large offices that could be converted to wards, the IOB was designed to be used, in the event of nuclear attack, as an alternative hospital. The Imperial Oil Building from the west, giving a better view of the observation deck at its top. The building sits atop a high escarpment with a commanding view to the south, and before the construction of the downtown banking towers, in the late 1960s, the top floor observation deck was, at almost 800 feet (244 metres) above sea level, the highest point in Toronto; on a clear day visitors could see the rising spray from Niagara Falls, across Lake Ontario. The ground floor lobby features a famous mural, “The Story of Oil”, executed by York Wilson in 1957. Three years in the planning and construction, the two panels of the diptych are each 25 feet by 32 feet; the left-hand side of the mural depicts the nature of oil from its prehistoric origins, while the right-hand panel portrays the modern benefits of its exploitation. The mural is made of vinyl acetate and is mounted to the wall in such a way that vibrations in the building will not be transmitted to the artwork, possibly causing it to crack. In addition, a ventilation system behind the same wall prevents moisture collecting on the material. Crawley Films of Ottawa was engaged to document the artwork’s realization. As announced in a press conference on September 29, 2004, the company has re-located to Calgary, Alberta (some corporate operations moved to the Esso Building at 90 Wynford Drive in Don Mills, Ontario). The building has been unoccupied for some years and is listed for sale. Soil testing before the property was listed found that sand about 40 feet below the parking lot was contaminated with heating oil that had leaked from an underground storage tank. The soil was excavated and taken away for cleaning. In preparation for the sale, the owners told Deer Park United Church next door that they would no longer supply building heat to the church, effective July, 2008. This led the dwindling congregation to leave the church and share space with a nearby Presbyterian church. The Deer Park church building also remains vacant as of January, 2010. The building was sold in the summer of 2010 to condominium developer Camrost-Felcorp. The converted condo will now be known as Imperial Plaza. Over at BlogTo, they had a chance to wander around the building before work started on it, and you can see that here. If you do get a chance, you must see the mural. It is fantastic. People who live in this condo should be quite fortunate indeed. Here’s to the growth of St. Clair, and the appreciation and new development of the buildings along the way. In this article, Secret Fears of the Super-Rich – Magazine, The Atlantic points to a big study that shows it doesn’t (no surprise), but it shows why. For the first time, researchers prompted the very rich—people with fortunes in excess of $25 million—to speak candidly about their lives. The result is a surprising litany of anxieties: their sense of isolation, their worries about work and love, and most of all, their fears for their children. An aside: once being a millionaire meant you were rich. Now it seems you need to have $25 million dollars to be rich. Back then, this was all new, or seemed to for me, even though I had been working over 10 years at the time. When I first started working, you had the staff and the staff had a manager (boss). It was highly hierarchical and not very fluid. Then the new “world without managers” came along, and it has been that way since. There are still people who don’t see this is how the world of large organizations work (or should work). But when you look at people who work in big business, the article says you have four roles: top executives, followed by resource providers, project managers, and the talent. I would add a fifth role: sales person. The execs set the direction, the sales people sell the talent, the resource providers and project managers care and feed the talent. That’s it. If you work for a large company, you are one of these. You might say: oh no, I am the manager/director/associate VP of XYZ. But if you look at what you are doing, chances are you focused mostly on doing one of those roles. Socialize | Unsuck It . What is your overused jargon? Type it in here: Unsuck It and unsuck it actually allows you to email it to someone if you want. (H/T to Andrew Sullivan for this).